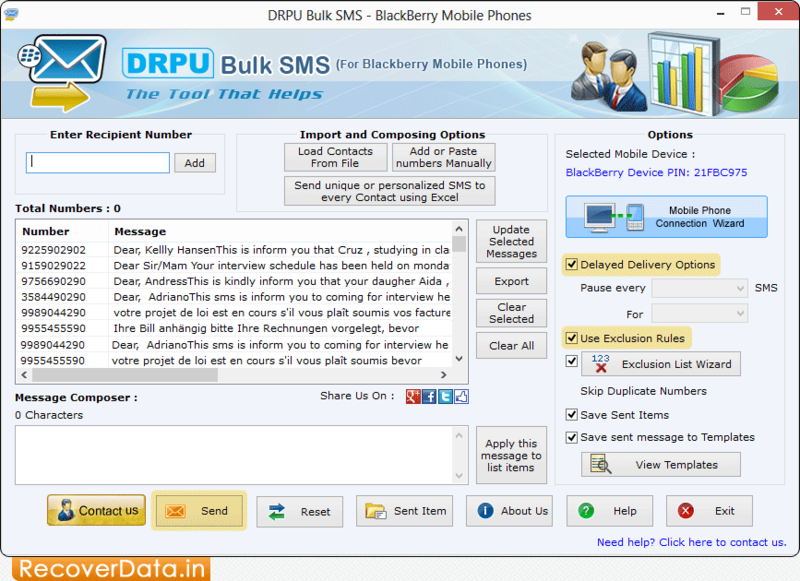 Bulk SMS Software for BlackBerry Mobile Phone is designed and developed with the latest technology to send group messages from PC to different mobile recipients via using BlackBerry cell phones. You can send thousands of text messages containing Unicode or Non-English characters on national as well as international mobile networks in just few minutes. Bulk Messaging tool enables users to broadcast personalized SMS, Job alerts, News alerts, Reminders, Stock market alerts, Special offers etc without any internet connectivity. 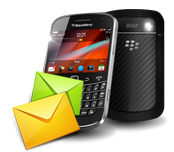 Send bulk SMS to any global mobile network using BlackBerry mobile phones. Provides an option to skip duplicate number entries. Inbuilt List Wizard option to maintain the list of contacts and groups. Software provides facility to load contact numbers from Excel sheets. Advanced Delayed Delivery option to control the load of SMS broadcasting. Supports Unicode or Non English characters to send SMS in different languages. Does not require internet connection to deliver messages.